After studying art and design in Canada, England, the Netherlands, Italy, Portugal and Germany, Brigitte Schuster now lives in Bern, Switzerland. She works as a graphic and font designer, as well as author and lecturer. 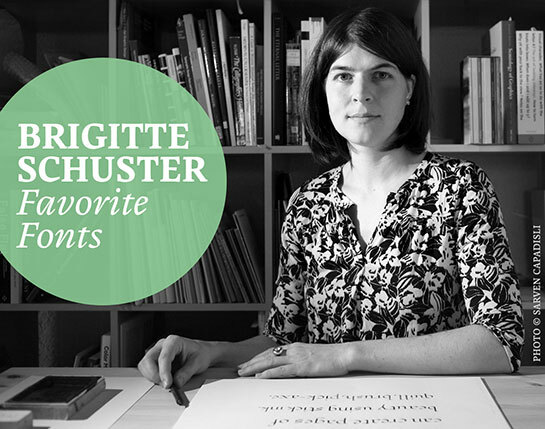 In 2013, she founded her own publishing house, Brigitte Schuster Éditeur. This gives her the freedom to work on not only her own projects, but any others that stimulate her imagination. Brigitte Schuster says that her love of typography grew slowly. It wasn’t until she worked with calligraphy and penmanship as a graphic designer that she became interested in font design. Now typography is one of her main focuses. Brigitte Schuster published her first font family, Cardamon™, in 2015. In a Linotype.com exclusive, Brigitte Schuster presents her favorite fonts and explains their historical context. Choosing six fonts from the wealth of available typefaces (from the start of printing at the end of the 15th century to today) was extremely difficult for me. It is much easier to choose fonts for an existing project that has restrictions in terms of content or form. I have attempted to select fonts from the range of various eras, or fonts that have the characteristics of these eras. I like the formal Renaissance features of Mendoza; the font appears more conservative than elegant. This is because the letters as a whole have little contrast‚ which makes them seem strong and robust. Even the relatively short ascenders and descenders add to this effect. Albertina appeals to me because of its classical Renaissance shapes. Its forms are at once calm‚ but alive with exciting details. The Albertina makes a graceful impression. The typeface is somewhat narrow‚ but this does not have a negative effect on the legibility. The serif font Swift impresses me through its good legibility‚ ensured by the horizontal reading‚ in that the letterforms lead the eye along the x-height. The typeface is more on the narrow side‚ but the letterforms are open‚ which accommodates legibility. With its flat serifs‚ Electra is among the “modern” fonts. It also has formal characteristics of Renaissances typefaces. Apart from the experimental design‚ I like the quiet appearance. The italic also appeals to me. It consists of the shapes of the Roman at a slight angle. As a result‚ the cursive does not appear as intrusive in a longer text. Univers has remained very popular from its creation in the 50s up to today. It is a timeless font that I’m always happy to use. The font is neutral without recognizable aesthetics‚ which makes it suitable for a wide variety of projects. The many styles of Univers make it a pioneer for the well-equipped font. I like it from a formal‚ but also a functional point of view. I like the revival of this grotesque from the early 20th century on the one hand because of its neutrality and‚ on the other hand‚ because of the specific details that developed from the German aesthetic influence. Why this grotesque‚ in particular? To me‚ it represents grotesque fonts in the wider sense. You can use it in many different ways‚ thanks to the many styles and features. • Gross price 58.31 USD/EUR including German sales tax.